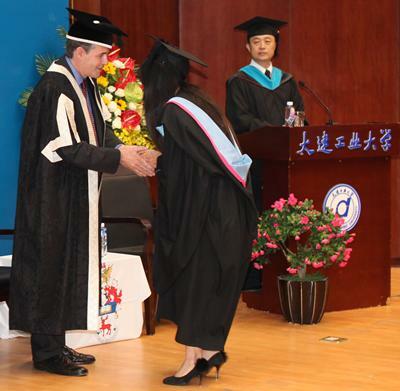 University of Southampton students have become the first ever to graduate in China from programmes offered by the institution’s Winchester School of Art (WSA). 69 students celebrated their success at a graduation ceremony held at the campus of Dalian Polytechnic University (DPU). DPU Vice President Professor Wendong Ren led the proceedings, presided over by University of Southampton Pro Vice-Chancellor Professor Alex Neill. The event was also attended by the Head of Winchester School of Art Dr Ed D’Souza and Associate Dean (Internationalisation) Stephen Mortimer. Dr D’Souza says: “I am delighted to see our first cohort of talented students graduate in China. It is the culmination of four years of hard work – by both them and WSA staff – helping to make our programmes in China a great success. Thanks to a successful collaboration between WSA and DPU, students based at Dalian have the opportunity to study either BA Graphic Arts or BA Fashion Design. The four year programmes, which include English language and design modules, offer students an opportunity to transfer to the UK, or continue their studies in China.